New Price $40.00 now $30.00! Dr. Petroc Willey, leads a panel of discussions with professors of catechetics and catechetical leaders in the field about handing on the Faith in personal, integral, and engaging ways. Whether you're a religious educator or an earnest layperson, these masters of catechesis can equip you to bring the Faith to anyone and everyone. Dr. Willey invites his guests to discuss and explain the purpose of catechesis, its progressive stages, its challenges, the sources of the Faith and how to implement them, and the vocation and role of the catechist. 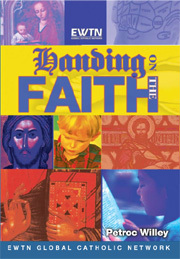 Every DRE and catechist will benefit from Handing on the Faith. The "pedagogy of God" lies at the heart of the restoration currently advancing in the area of religious education and catechesis. According to the General Directory for Catechesis, the primary difficulty facing catechesis today is that catechists do not yet have a full understanding of "the conception of catechesis as a school of faith, an initiation and apprenticeship in the entire Christian life." The Church has a unique form for transmitting the Faith. The Church calls this the "pedagogy of God." It is from this pedagogy that catechesis should take its inspiration and its life. The central truth is that God Himself is the pedagogue. Catechists and those being catechized are invited to co-operate with Him in learning under His grace. Catechetical leaders will be happy to find within these pages scholars and practitioners of catechesis, who address many aspects of communicating the Faith, yet with the united purpose of answering the primary question of catechesis as a “school of faith” embracing the entire Christian life. It is here that we and the crucial place of The Pedagogy of God: Its Centrality in Catechesis and Catechist Formation. If you order 10 or more copies, you pay only $8 per book! In these 12 chapters of historical narrative, personal reflection and prayer, religious educators, youth ministers and parents will be inspired and challenged by these pioneers of faith. Beginning with Our Lady of Guadalupe and St. Juan Diego, Sr. Johanna Paruch tells the stories of these saintly evangelizers and catechists of the “New World” and highlights what made them successful at drawing people into close relationship with Christ. Mentors for the New Evangelization: Catechetical Saints of North America includes the lives of the North American Martyrs, St. Marie of the Incarnation, St. Marguerite Bourgeoys, St. Rose-Philippine Duchesne, St. Elizabeth Ann Seton, St. Mother Theodore Guerin, St. Junipero Serra, St. John Neumann, Ven. Fr. Michael McGivney, St. Katherine Drexel, Bl. Miguel Pro, and more. This is a must read for anyone in faith formation! Makes a great gift for Catechetical Sunday, Christmas, special recognition, or anytime. If you order 10 or more copies, you pay only $10 per book! Como padres de familia católicos y educadores religiosos, podemos sentir como si estuviéramos perdiendo la batalla que estamos librando cuando confrontamos las estadísticas actuales de los que abandonan su fe. Sin embargo, si recurrimos a las obras poderosas del Espíritu Santo a lo largo de la Historia de la Iglesia, nos inspira una nueva confianza en que Dios seguirá llamando a hombres y mujeres santos para difundir la Buena Nueva. En estos doce capítulos de narrativa histórica, reflexión y oración, vemos que los santos están dispuestos a morir por la fe, porque ante todo es una fe que vale la pena vivir. A mediados del siglo XVI, un estimado nueve millones de indígenas entraron a la Iglesia como resultado de la visitación de Nuestra Señora de Guadalupe ante el campesino Juan Diego en México. Luego los misioneros que llegaron al "Nuevo Mundo" entregaron su vida por Cristo en la obra de evangelización y catequesis. Estos santos de la catequesis son nuestros Mentores para la Nueva Evangelización. Sin el lujo de recursos monetarios o tecnológicos, estos pioneros de la fe en Norteamérica vencieron obstáculos que parecían insuperables, y forjaron un camino para llevar a todos los que enseñaban hacia una unión íntima con Cristo. Aunque muchos de ellos eran talentosos e ingeniosos, fue su humildad y su santidad de vida centrada en Cristo que atraía la gente a la fe. Que estos mentores nos guíen en la Nueva Evangelización. Sor M. Johanna Paruch nació en la provincia de Nueva Escocia en Canadá, y es miembro de las Hermanas de San Francisco del Mártir San Jorge. Ha estado involucrada en la catequesis desde hace casi 40 años. Recibió su Maestría en Educación Religiosa del Angelicum y su Doctorado en Catequética del Maryvale Institute en Inglaterra. Actualmente funge como Profesor Adjunto de Teología en la Franciscan University of Steubenville en Ohio. Popes are the Church's chief shepherds. While some focused on governing the Church and addressing challenges from the world, others recognized their primary responsibility to proclaim and teach the Gospel. Author Alan Schreck calls these the teaching popes and John Paul II was such a pope, leading the Church and impacting the world with his witness and his teaching. The encyclical letter has been, in modern times, the instrument for popes to express their most important teachings that have lasting value for the Church, and often for the whole world. Dr. Schreck invites the reader to become familiar with the encyclical letters of Pope John Paul II. In The Legacy of Pope John Paul II, Dr. Schreck breaks down more scholarly writing into accessible language. The reflection questions and suggestions for further reading at the end of each chapter help facilitate a systematic study of the central teachings of this brilliant but pastoral pope, who conveyed the truth in love.